I’m a big believer in not drinking in your calories. It’s too easy to quaff countless calories in the big calorie bombs (not to mention actual milkshakes) that nowadays masquerade as coffee drinks. Remember when Britney Spears gained all that weight a few years back? At that time, I remember seeing numerous pictures of her, with a huge takeout coffee from Starbucks in her hand. People tell themselves, “It’s just a coffee,” when in real life, most flavored coffees are filled with cream, sugar, and fatty flavorings. As an author and spokesperson who likes to stay a size 4, I can tell you: these sugar-flavors are just like the real deal, only flavored with calorie-free Splenda. I also like to make lowfat 25-calorie cocoa, and mix it with any variety of sugar-free Torani syrups, including hazelnut and pumpkin pie, which has a delightful mix of nutmeg and cinnamon. 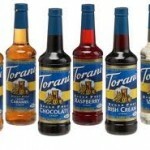 For those of you who love to bake, sugar-free Italian Torani syrups will pack a punch to pie, flavored whipped cream, candied pecans and bread pudding. Ciao, bella! 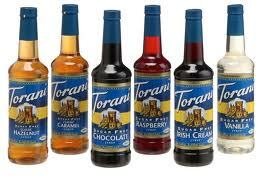 If you make your own lattes, brewed coffees, mochas – or even want flavored water – sugar-free Torani syrups are the way to go. I’ll drink to that!